PLEASANTON � During the holidays, it's clearly the most lit-up house in the cul-de-sac � there are not only lights, but a manger scene, wooden cutouts straight out of Christmasland and other decorations. 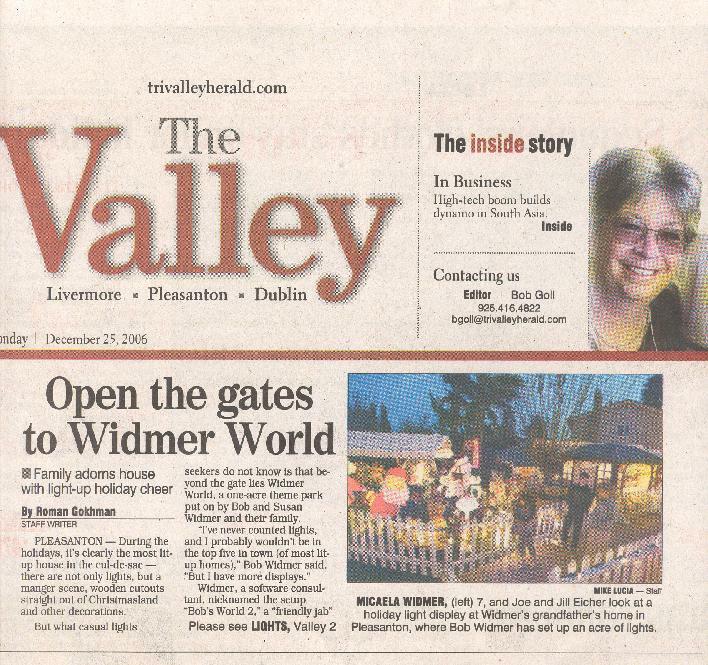 But what casual lights seekers do not know is that beyond the gate lies Widmer World, a one-acre theme park put on by Bob and Susan Widmer and their family. "I've never counted lights, and I probably wouldn't be in the top five in town (of most lit-up homes)," Bob Widmer said. "But I have more displays." Widmer, a software consultant, nicknamed the setup "Bob's World 2," a "friendly jab"
at another spectacle across town put on by Bob Stanley. Widmer has decorated his property since the'80s and said he started "dumbing down" the front of the house a few years ago to get more people to come inside. "We started doing it a little bit at a time," Widmer said of his decorations. The property looks a little different each year, to keep it fresh for repeat guests. As children go through the side gate to the backyard, they are greeted by animatronic plush animals, miniature carnival rides ferrying plush penguins and elves, cut-out cartoon characters like Bart Simpson, and blow up snow globes, Santa Claus, reindeer and snowmen. "We just love doing it," Widmer said. "We felt it was really neat to give the kids something to see." Micaela and 10-year-old Jill, and grandson, 12-year-old Joey, also help with the decorations. Inside Bobville, one of the many decorated sheds on the property, children can see a train set chugging through another town scene. There is an outdoor, child movie theater. A few nights each December Santa Claus comes to visit. "A couple of nights my daughter (Kristine Widmer) is Santa, but you'd never know," he said. On an average weeknight in December 50 to 150 visitors come to the home, and up to 500 are expected when Santa is in town. Although they don't have to, parents may slip donations into a box, which go to several charities and help pay the Widmers' electric bill. Kristine Widmer, a kindergarten teacher, said she loves helping out because she knows many of the children who visit. "I love doing it," she said. Visit Widmer World at 3671 Chelsea Court in Pleasanton, 6 to 10 p.m. Friday and Saturday and 6 to 9 p.m. Sunday to Thursday through Dec. 31. This Article Created by Tri-Valley Herald - Roman Gokhman who can be reached at (925) 416-4849 or at rgokhman@trivalleyherald.com. with photographs provided by Michael Lucia of the Tri-Valley Herald.